Enhance literacy while you nurture curiosity. 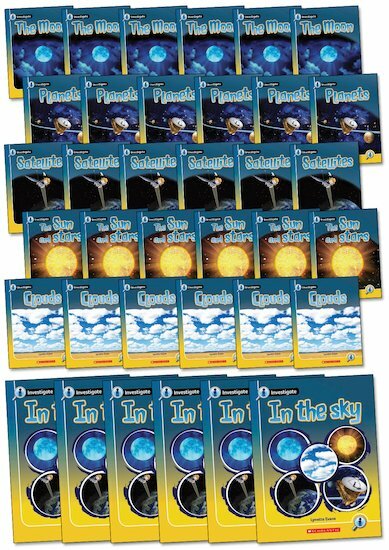 Investigate is a KS1 non-fiction series which introduces popular science topics using visually stunning photographic books which are ideal for guided and independent reading. The fully book-banded series is divided into themed strands, each of which consists of an overview book plus five companion titles. Combining easy-read text with dramatic visuals and attention-grabbing facts, Investigate makes a perfect introduction to non-fiction for readers who are growing in confidence. The series also builds familiarity with the conventions of non-fiction texts using features such as contents pages, a glossary and index, captions, fact boxes, maps and diagrams. This multipack from the ‘In the Sky’ strand explores a well-loved topic from many different angles. It contains six copies of each of the six titles in the strand.